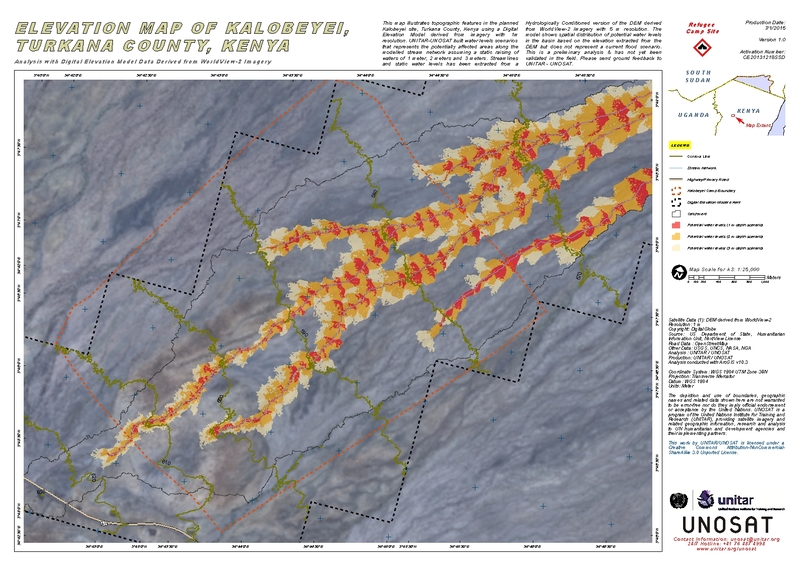 This map illustrates topographic features in the planned Kalobeyei site, Turkana County, Kenya using a Digital Elevation Model derived from imagery with 1m resolution. UNITAR-UNOSAT built water levels scenarios that represents the potentially affected areas along the modelled stream network assuming a static raising of waters of 1 meter, 2 meters and 3 meters. Streamlines and static water levels has been extracted from a Hydrologically Conditioned version of the DEM derived from WorldView-2 Imagery with 5 m resolution. The model shows spatial distribution of potential water levels in the basin based on the elevation extracted from the DEM but does not represent a current flood scenario. This is a preliminary analysis & has not yet been validated in the field. Please send ground feedback to UNITAR - UNOSAT.